Smartphone and tablet users will automatically get a mobile form providing them the best possible experience on a mobile. As Facebook evolves, they are changing their platform and policies. This sometimes has the unfortunate side effect of breaking existing ways to integrate third-party content with Facebook. Linking should always work. The first step is to create a form with the online form builder. Building a form is easy; simply sign up for a FormSmarts account if you haven't got one, then log on to create a form. Most people find using the form builder simple and intuitive. If you do need help, there is a complete tutorial with a 4 min video introduction to get you started. The simplest an usually best way to add a form to Facebook is to post a link to the form on your page. Click on the URL link in the Forms Tab of the online form builder to view the URL of your web forms. You can also get the FormSmarts.com URL and shortened URL of the form in the Form Publishing Info screen of the form builder (screenshot below). Another way to add a form to Facebook is to integrate it in its own tab on your Facebook page. Follow the three steps below to embed a form into Facebook. Many Facebook users (most users in some countries) access Facebook with their mobile. If you embed a form on Facebook, it won't work with mobiles (Facebook doesn't support this on their mobile site and apps), so you should always include a link to your online form on your Facebook page. This will ensure mobile users are able to access the form using that link. Add the Static HTML application to your Facebook page. If requested by Facebook, change to Use Facebook as your personal profile. The form should now appear in a new tab on your Facebook page. To change the tab's name, click Select Apps on the right column, then click on Static HTML: iframe tabs and Edit Settings. Since Nov 2013, forms won't show on a Facebook pages unless they are loaded via a secure connection (SSL/TLS a.k.a. HTTPS). Since FormSmarts only supports secure forms with Business accounts, forms embedded onto Facebook will no longer work with a Free or Pro account. If you have a Free or Pro account and the form doesn't show up, please link to the form as described above instead or upgrade to a Business account. If you are a Business user, Please get a new copy of the Facebook embedding code from the form builder and make sure storage of form responses is turned on for that form. This option is kept for information purposes but will no longer work with the current version of the Facebook. In Pages You Admin, click on Edit Page to edit the page where you want to place a FormSmarts form widget. At the bottom of the page, click on Browse More under More Applications and Add a Static FBML Box. Edit the page. 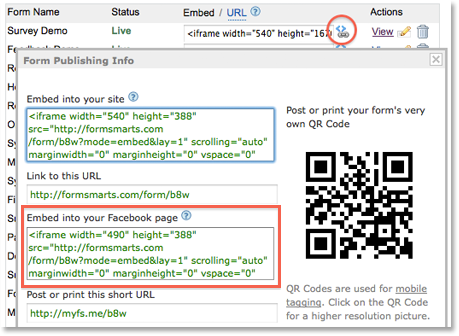 Visit the Forms tab of the form builder to get the HTML code for embedding your form. Next, replace the portions of text that appear in yellow in the FBML code below by the actual values given in the form embedding code. Unless the form you've added to your Facebook page is short, you will need to move the static FBML box to its own tab of your Facebook fan page.